Chocolate Pumpkin Ice Cream Sandwiches-a fun treat for Halloween or any fall day! Halloween is next week. Do you have your costume ready? Josh and Caleb are dressing up as cowboys, but I don’t have a costume yet. I think my every day mask is scary enough:) I am prepared when it comes to sweet Halloween treats. We are celebrating the holiday with Chocolate Pumpkin Ice Cream Sandwiches. 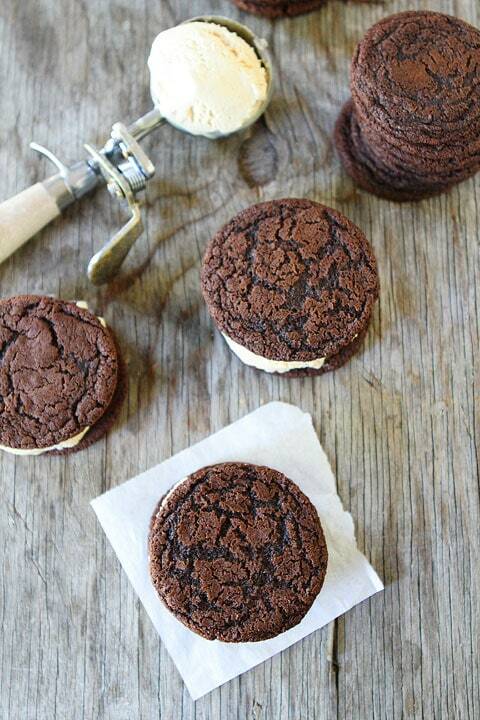 Pumpkin ice cream sandwiched between two rich chocolate cookies, I am not tricking you. These ice cream sandwiches are a real treat! Caleb is currently on an ice cream kick. He asks for it every day. He doesn’t always get his way, but sometimes mama gives in! I knew he would love Chocolate Pumpkin Ice Cream Sandwiches. Cookies AND ice cream? Caleb’s dream dessert…and mine! Caleb helped me bake the chocolate cookies. We used our favorite flour, Gold Medal Flour. To ensure the highest quality product, Gold Medal Flour mills their own flour. Cool, huh? We visited the Mill last year. It was neat seeing the whole process. We are Gold Medal fans for life! I let Caleb scoop the flour. He looked like a ghost when we were done. Maybe he should be a flour ghost for Halloween instead:) We made a mess, but that’s what kitchens are for! Our cookies baked up perfectly-rich and chocolaty! I love having a baking buddy! Chocolate and pumpkin are a dangerous combo. Pumpkin Chocolate Chip Bread, Pumpkin Chocolate Chip Cookies, Pumpkin Chocolate Chip Bars…I love them all! I knew pumpkin ice cream would be the perfect filling for our chocolate cookies. Plus, the ice cream sandwiches look festive! They are perfect for Halloween…or any fall day! We used store bought pumpkin ice cream, but if you are feeling ambitious you could churn up your own! I kept the Chocolate Pumpkin Ice Cream Sandwiches simple, but you could roll them in chocolate chips, Halloween M&M’S, sprinkles, or nuts! Go crazy!! And you can make these in advance, just wrap the sandwiches in plastic wrap and freeze! 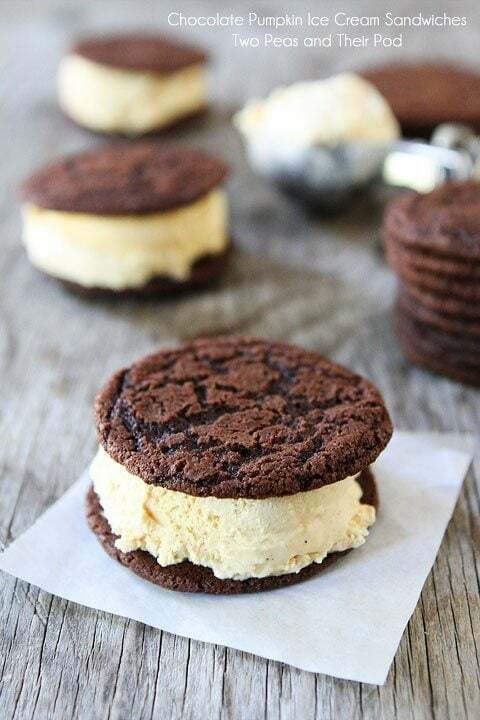 Just pull the ice cream sandwiches out when you are ready to serve. These are perfect for a Halloween party! Make your Halloween happier by eating a Chocolate Pumpkin Ice Cream Sandwich! Make sure you share with all of the ghosts and goblins out there too! 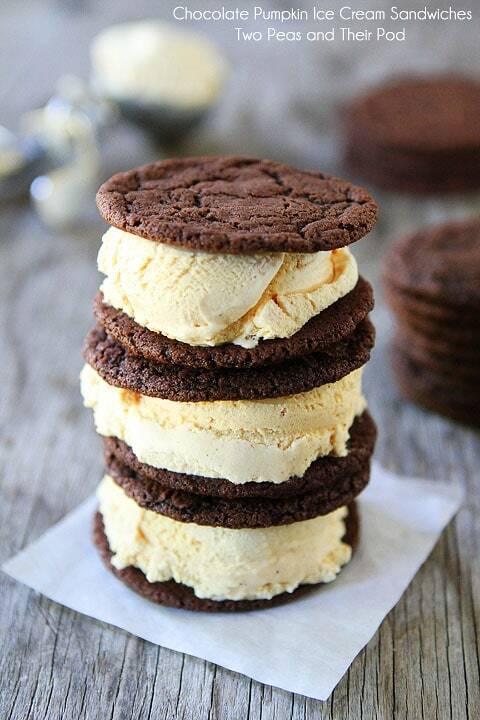 Pumpkin ice cream gets sandwiched between two chocolate cookies! A fun treat for Halloween or any fall day! 4. Slowly add flour mixture to sugar mixture and mix until flour disappears. Drop cookie dough by rounded tablespoons onto prepared baking sheet, about 2 inches apart. 5. Bake cookies for 10 minutes, or until the cookies are set around the edges, but still soft in the center. Don't over bake. Remove from oven and let sit on baking sheet for 3-5 minutes. Move to a cooling rack and cool completely. 6. Turn one cookie over and place a large scoop of pumpkin ice cream on the bottom of the cookie. Place another cookie (right-side-up) on top of the ice cream and squeeze them together a bit to push the ice cream to the edges. Eat immediately or wrap in plastic wrap and place in freezer bag to eat later. Continue making ice cream sandwiches with the rest of the cookies and ice cream. Note-this recipe makes about 30 chocolate cookies, so about 15 ice cream sandwiches. You can half the cookie recipe if you don't need that many. Or you can just eat the chocolate cookies or put them in the freezer! This post is in partnership with Gold Medal Flour, but our opinions are our own. Those look so good! I really want to try them! These sound lovely! Chocolate and pumpkin are soooo good together! Love chocolate and pumpkin together! Ohhh, the cookies look so good and soft!! Love the addition of pumpkin ice cream!! Ha! ha! I tell my kids I’m scary looking enough too. I also tell them I’m in charge of the food and making sure they are safe and they are in charge of having fun. These look delicious–great choice for Halloween night. (Hopefully it’s a warm one this year, fingers crossed). Planning costumes is so stressful. I’d much rather plan the menu! 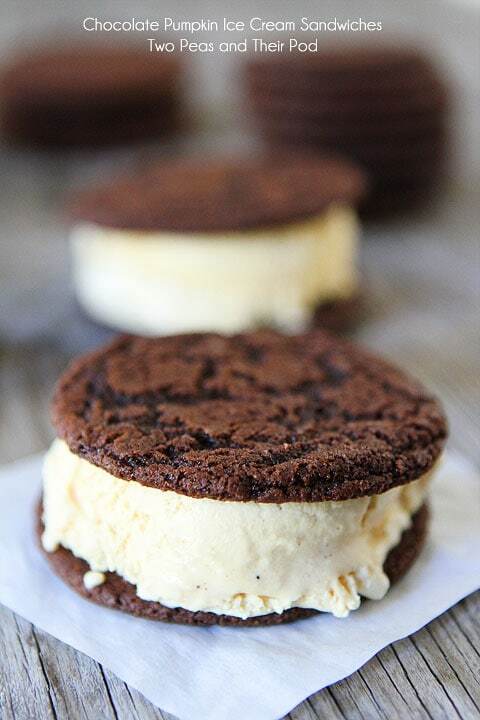 These ice cream sandwiches look purrrfect!! Love your line about him being a ghost for halloween because he was covered in flour! I’m still scrambling for costume ideas, so maybe I’ll give that one a try. This is too funny–yesterday I was just thinking about pumpkin and how it would be amazing to use for a ice cream cookie sandwich. And lo and behold, I wake up to see that you have! 🙂 These are beautiful!! Such a perfect combo. Chocolate and pumpkin are besties! Ooo..love pumpkin & chocolate together. This sounds so good, especially since it’s not really cold yet here! The babies are about to punch through my stomach for these sammies. Ugh. Even though it is only time for breakfast, I wish I had one of these right now! I love the combination of pumpkin and chocolate. I think I’m just going to camp out downstairs and wait for the kiddies to arrive 🙂 no dressing up for me! These ice cream sandwiches look fabulous. Way better than ones we had a restaurant this past weekend, for sure! 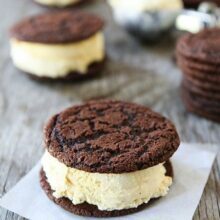 Even though it is currently pouring rain and freezing in Washington state, I want these ice-cream sandwiches right.now. These look amazing! Such a yummy flavour combo. I’m loving this combo! 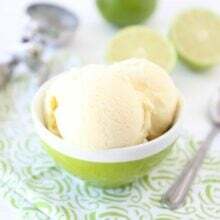 And who says ice cream is strictly for summer? Bring these sammies on! I love this combo! the cookies look spectacular! What great Fall treat! Love it! Yes! I love these, Maria. What a great flavor combo. Now to find some pumpkin ice cream! I bet your little pod loves these sandwiches. I know I do I haven’t even tried them. YUM! Chocolate and pumpkin together and with ice cream too! Amazing cookies + stunning photos! LOVE! Oh and I so need some instagram pics of Caleb in his costume! I love pumpkin with chocolate, these look fab! My dreams just came true! I love it all…chocolate, pumpkin, cookies, ice cream! 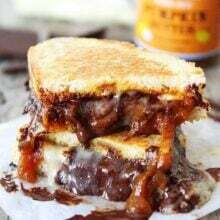 I’ll definitely be making these and stocking my freezer with them this fall! I love that Caleb helped you with these! They look amazing, and with the heat wave here, I could definitely use a couple of these! ice cream sandwiches for teh win! 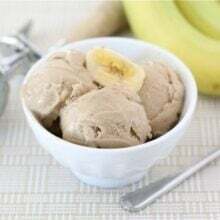 Yum, I have had a huge craving for ice cream lately. I NEED these! And those cookies look so perfect! Oh my goodness, this looks fantastic!! 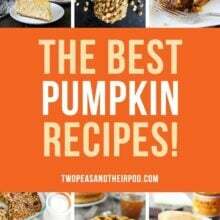 I can’t believe I have not made anything with pumpkin yet! these look like the perfect Halloween treat to me! These are gorgeous! Love the idea of choclate and pumpkin togehter. Now I can’t wait to make my own.